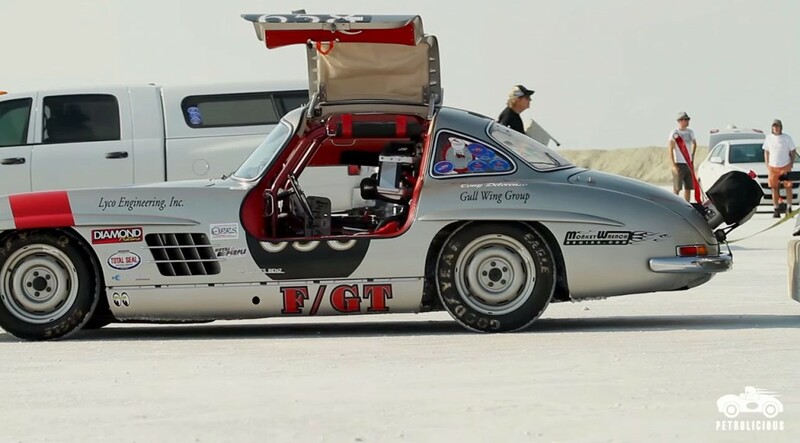 Racing your Mercedes-Benz 300SL Gullwing on the Bonneville Salt Flats may be bad for your car, but is it good for your soul? There are more than a few ways to enjoy your toys, from driving them to racing them or even collecting them in your garage. Pleasure of ownership can be derived in many different ways. For Bob Sirna, this comes from racing at the salt flats of Bonneville. Various types of cars run at Bonneville, but Bob chooses to run a car that you wouldn’t ever expect to be racing, let alone down a strip of metal-eating salt. A classic Mercedes-Benz 300SL Gullwing which will now fetch over a million dollars from discerning collectors. The 300SL is a car you’re most likely to see at a concourse or perhaps in a museum — not trying to break land speed records at Speed Week. For the last 12 years Bob has been bringing his Gullwing to the salt in an effort to break records and cure his “salt fever.” Bob likes to say, “Enjoy your toys,” and with a toy like this, who can blame him..